In the recent years of my life, I have been looking towards natural remedies and healthier products. 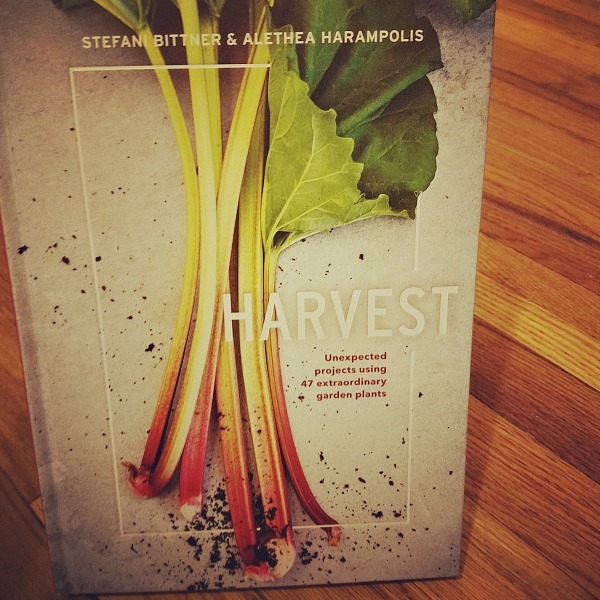 Harvest by Stefani Bittner and Alethea Harampolis gives us 47 uses of garden plants. The recipes range from food to dye. All of the instructions are easy to follow and the photography is great. I never realized how many garden plants could be used, especially for food. Before each recipe or DIY project there is a description of the plant being used. It also tells you when to harvest the plant. Said to be the perfect scent for a fragrance minimalist like me. I have gotten quite sensitive towards smells, especially perfume. I like the more natural scents such as rose and lavender. I love margaritas. Pomegranate flavor would be great for the summer. Smudge sticks are dried herb bundles that are burnt as incense. In the book, rosemary branches are used. I also like the idea of mental clarity and calmness. This book has such amazing ideas. I'd like to eventually try all of them. The authors are co-founders of Homestead Design Collective. It is a design landscape firm that creates beautiful gardens that provide harvest. What a wonderful company. I dream of having a nice bit of land to have a garden and grow my own veggies. This book would be great for any garden enthusiast. Classic cocktail meets holiday tradition, compliments of Stefani’s mom, Garna, who took the margarita and dressed it with a splash of festive red. Whether you are making a single glass or a pitcher, the ratio of the ingredients stays the same. Use more lime juice if you prefer a tart margarita or more pomegranate juice if you prefer it sweeter. Combine the tequila, triple sec, and both juices in a pitcher and stir thoroughly. Pour the salt onto a small plate. Rub the lime slice around the rim of each glass, and then dip the rims in the salt. Pour the margarita over ice in the salt-rimmed glasses. For a seasonal festive touch, garnish with the pomegranate seeds. Do you have a garden? What do you like to grow? Pomegranate margarita? Oh my that sounds absolutely amazing!!! Learning to make some useful and creative things with plants would be great! This is a nice incentive to start growing more plants or make more stops at the Farmers' Market. This looks amazing. My husband loves to garden, and it would be great to have more options about what to do with some of the things he grows. I would love to try all of these too! Especially the Pomegranate Margarita. Yum! I want this book simply for its gorgeous cover! The fact it's covering a topic I find fascinating is quite the bonus too. We love discovering new plants both in nature and while food shopping, it looks like this book would make those discoveries even more fun! I need to get this book. It sounds so interesting. Oh my goodness. Pomegranate Margarita. Yes! Ready for the summer. Oh my goodness, now I want to try that marg recipe too! It doesn't hurt that it's almost happy hour time. Bwah!